LSD is a hallucinogenic drug known for producing altered mental states, changes in mood and a distorted sense of reality. It is a semisynthetic chemical made from the ergot fungus, a grain fungus that grows on rye grain. The drug is sold in tablet form or infused onto sugar cubes, thin squares of gelatin or blotter paper. LSD has a number of physical side effects, including irregular breathing, nausea, hypertension and increased body temperature. It is not known to be addictive, but regular users develop a tolerance to the drug. Lysergic acid diethylamide, also known as LSD, is a hallucinogenic drug best known for its ability to produce altered mental states, visual hallucinations, and synesthesia, or the experience that senses are being crossed over—for instance, hearing colors or seeing sounds.Pure forms of LSD occur as a clear or white crystalline substance when stored at room temperature. LSD can be sold in tablet form, or infused onto sugar cubes, thin squares of gelatin, or blotter paper for oral consumption. LSD is a semisynthetic chemical derived from the ergot fungus, a grain fungus that typically grows on rye grain.1 A Sandoz Laboratories chemist named Albert Hoffman first discovered its hallucinogenic properties in 1943. Sandoz hoped that the discovery would translate to clinical use. But by the 1960s, its widespread use was almost entirely recreational. LSD is believed to affect 2 neurotransmitters: serotonin and glutamate. It is unclear how LSD produces its effects. But it is believed to affect 2 neurotransmitters in the brain. A popular theory is that it acts as a serotonin receptor agonist, which leads to increased levels of this neurotransmitter in the brain.2 Serotonin affects mood, appetite, sexual functioning and sleep cycle. Additionally, in concert with serotonin, glutamate activity helps to mediate the brain’s response to a variety of sensory stimuli and is thought to play a role in the mechanism underlying the intense hallucinations of LSD. Whether or not you have insurance, and how much it will cover. Whether the program is outpatient, 12-step or inpatient. How long you remain in the program. Below are options for how to find a rehab center with or without insurance. Have insurance. Find out what your insurance covers and what treatment options are available to you by calling . Don’t have insurance. You can finance your recovery or call the Substance Abuse and Mental Health Services Administration to get help finding a program without insurance. Dual diagnosis programs. Dual diagnosis drug treatment centers can treat your LSD abuse along with other psychological or addiction problems you or your loved one may have. Many people who abuse LSD also abuse other drugs. Inpatient rehab. An inpatient or residential program is a live-in facility. You remain at the center and complete a programthat includes detox, medication treatment, individual or group therapy and possibly 12-step meetings. Many people with persistent addiction problems benefit from these facilities. Outpatient rehabilitation. Outpatient features a similar course of treatment as inpatient. However, you do not live at the treatment center. 12-step programs. Twelve-step programs are modeled after the Alcoholics Anonymous recovery program. They are free to attend. Narcotics Anonymous is a popular program for people with a drug addiction. Find out more about how to choose a rehab program for LSD abuse. Persistent psychosis: includes visual disturbances, disordered thinking, paranoia and mood disturbances. Hallucinogen persisting perceptual disorder: includes hallucinations and other visual problems such as seeing halos or trails on moving objects. Neither of these conditions is common. They are more likely to occur in people who have a history of psychological issues. But they can happen to anyone and even happen after taking the drug once. LSD’s effects can cause users to experience extreme panic and anxiety. Some users fear that they are losing their sanity or dying. Some users may also have flashbacks, where they relive part of their LSD experience. These can happen anytime—even more than a year after using the drug. 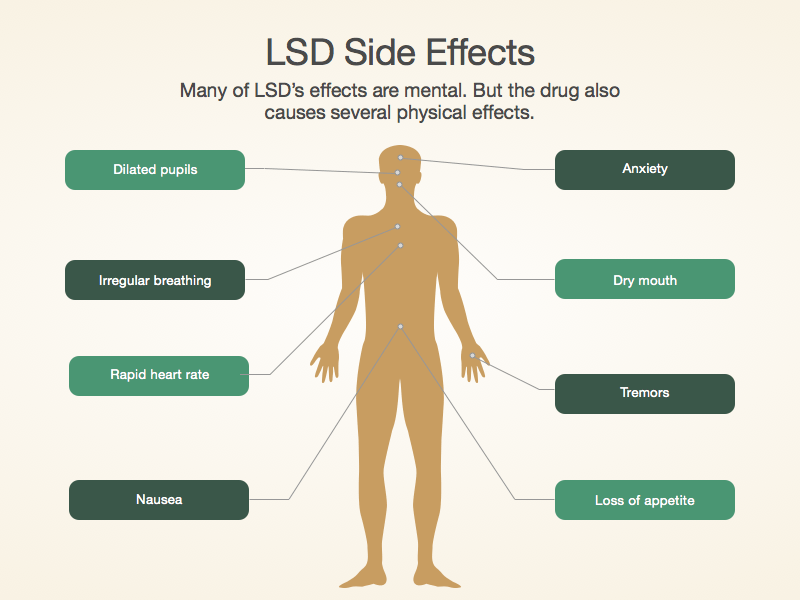 LSD is not considered a physically addictive drug, and its toxicity is relatively low. It is not available by prescription, and it is illegal to use or possess LSD. Unlike alcohol, cocaine, or heroin, LSD does not lead to compulsive drug-seeking behavior. That said, hallucinogen use disorder is one of the rarest substance use disorders. Within the mental health community, there are not confirmed withdrawal symptoms associated with LSD. Regular users do develop tolerance with repeated abuse, though. It is difficult to overdose on LSD, and no deaths have been reported from overdose. The 2014 National Survey on Drug Use and Health found the following rates of current LSD use. These rates appear to be relatively stable since 2002. 0.1% of those age 12 or older. 0.3% of those age 12-17. 0.3% of those age 18-25. 0.1% of those age 26 or older. These rates represent a slight decrease from 2013 and continue a downward trend since 2011. If LSD use has become a problem for you or someone you love, call 1-888-319-2606 Who Answers? . You’ll be connected with a caring treatment support specialist who can provide information about substance abuse rehabilitation options.
. Passie T, Halpern JH, Stichtenoth DO, Emrich HM, Hintzen A. The pharmacology of lysergic acid diethylamide: A review. CNS Neuroscience Therapies 2008;14:295-314.
. Watts VJ, Lawler CP, Fox DR, Neve KA, Nichols DE, Mailman RB. LSD and structural analogs: Pharmacological evaluation at D1 dopamine receptors. Psychopharmacol 1995;118:401-409.
. Strassman RJ. Adverse reactions to psychedelic drugs: A review of the literature. J Nerv Ment Dis 1984;172:577-595.
. Winstock AR, Kaar S, Borschmann R. Dimethyltryptamine (LSD): Prevalence, user characteristics and abuse liability in a large global sample. J Psychopharmacol 2014;28:49-54.